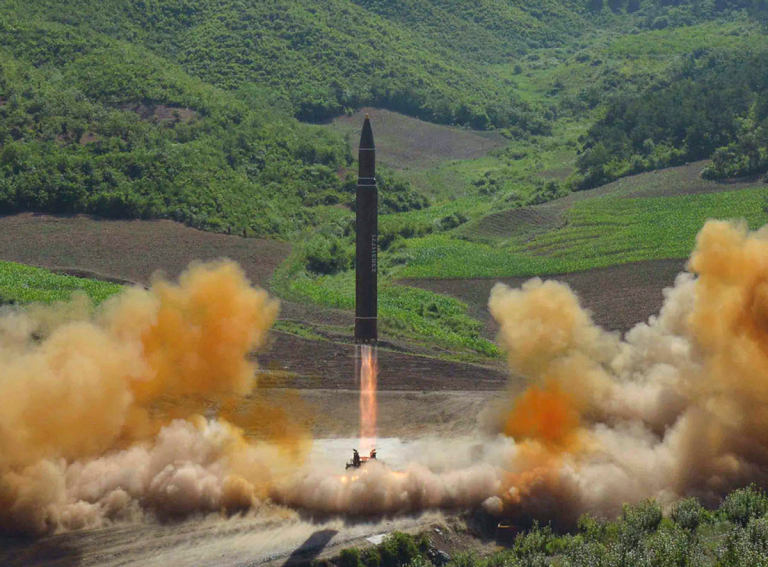 The test launch of North Korea’s Hwasong-14 ICBM on 4 July produced a predictable outpouring of official statements and media articles claiming that the United States is under an existential threat of an unprovoked attack from North Korea. ‘North Korea brings missile threat to the US: What does Trump do now?’ asked CNN. And it’s not only the US that is in danger, according to Secretary of State Rex Tillerson. North Korea poses ‘a global threat,’ he said, so from Patagonia to Peoria, the world is at risk. Actually, if there is one thing that is certain in life in addition to death and taxes it is that North Korea will not attack the US except in retaliation. The reason for this is obvious. America’s military superiority is so overwhelming that retribution would be devastating and would mean the end of North Korea. The balance of military power between the US and its ‘allies’ (the imperial alliance structure is a major part of American power) scarcely needs elaboration or documentation. South Korea on its own has a military budget perhaps 30 times that of the North, has, generally speaking, much more advanced and modern equipment (it buys more weapons from the US than even Saudi Arabia) and, according to the International Institute for Strategic Studies (IISS), can field two and a half times more troops (standing army plus reservists) than the North. Bring in the US and its allies, including especially Japan, and the imbalance is astounding: a combined military budget of roughly $1 trillion against North Korea’s $1.2 to $10 billion. The portrayal of North Korea as a threat to the US is not merely wrong, it is preposterously and diametrically at variance with reality. Yet it is widely believed. That is mainly due to omnipresent and repetitive propaganda, and as Harold Pinter pointed out in his Nobel lecture, the ‘United States is without doubt the greatest show on the road’ in that respect. And as we know, things that are repeated without contradiction, however silly and devoid of evidence or plausibility, tend to be believed. Not merely would retribution be inevitable, but nothing could possibly be achieved by a preemptive North Korean attack on the United States. What would be the point, for instance, of North Korea launching a missile against Hawaii, as feared by authorities there according to a Yonhap report? Would Washington in terror ship the contents of Fort Knox off to Pyongyang? Would Kim Jong Un send in a fishing boat to harvest the irradiated pineapples? The only way to overlook the absurdity of the notion of an unprovoked attack is to construct a pastiche of North Korea and its leaders as irrational, as, for instance, Nikki Haley did recently. The problem is that you have to be deeply ignorant (that’s probably her excuse) to believe such nonsense, because no one with a modicum of knowledge does. Or perhaps to believe North Koreans are mad, you have to be mad yourself–an irony which Joseph Heller of Catch 22 fame would have enjoyed. Ambassador Haley might conceivably put her hand up for that one as well. Why the hysteria and hyperbole about North Korea? Why is its deterrent against American attack recast as an existential threat to the US as if North Korea were some sort of national suicide bomber? If there is no attack, there is no retaliation. If the US adopted a peaceful, non-threatening policy towards North Korea, the danger of war would wither away. North Korea’s nuclear disarmament is irrelevant. A number of countries could, in theory, attack the US with nuclear missiles: Russia and China certainly, India perhaps, and Britain, which is, after all, the only country to have mounted an attack on the United States with the burning of Washington in 1812. But no one for a moment thinks that Britain would do such a thing. Partly this is because of their shared history, but also because of two reasons that are common to Britain and North Korea (and every other country for that matter): no advantage would be gained, and the retribution would be terrible. If Britain destroyed New York or Washington (again), or if in a few years’ time North Korea laid waste to San Francisco, what then? What would be achieved? The idea is preposterous. Why, then, is the myth of a North Korean threat so constantly and assiduously cultivated? An explanation can be located at three levels – the bilateral, the regional, and the global. 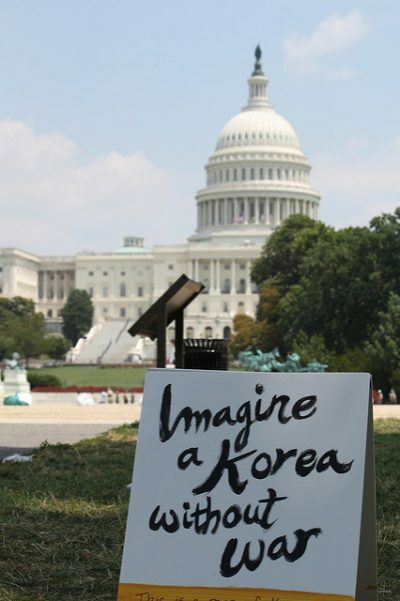 The Korean War was the first war that the United States did not win. Objectively it was not a defeat such as in Vietnam where the Vietnamese, principally on their own, evicted the US from the whole of the country. In Korea, the US basically held on to the status quo – the southern part of the country inherited from the Japanese – despite massive Chinese intervention. But it was the first such setback, and North Korea’s resilient defiance ever since, despite generations of US sanctions and threats, surely rankles. To destroy North Korea would be sweet revenge, both for the US and large swathes of the South Korean military and civilian elite. On a broader scale, the so-called ‘North Korean threat’ provides the capstone for the US military and political architecture in East Asia, the primary function of which is now the containment of China. The original division of the Korean peninsula in 1945 was driven by the strategy of containing the Soviet Union, but since then Russia has become the minor, though still important, player in this theatre. The continued political subservience of Japan plays an important role, though there is a latent contradiction between that and the US encouragement of Japanese remilitarisation. ‘Containment,’ although a much-used word, is inadequate, because the ultimate strategic objective is enfeeblement, probably through fragmentation or a first (nuclear) strike. The deployment of the THAAD in South Korea and the X-band radar in Japan is a component of first-strike capability. In the meantime, its need for the ‘North Korean threat’ poses a dilemma for the US. Removal of that ‘threat,’ either through military action or a genuine peace process, would make it difficult to justify the US military presence and its concomitant political dominance in South Korea, and to a lesser extent, in Japan. 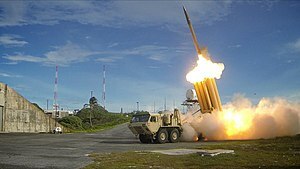 South Korea has no particular animus against China, which is why the THAAD deployment had to be disguised as a protection against North Korea. Japan is different, because China is seen as the only rival in Asia, and the Japanese conservative elite needs no persuasion to join an anti-China coalition even if, at the moment, in a subordinate position. Finally, there is the purely global dimension. North Korea poses no direct military threat to the US, no matter how many nuclear ICBMs it is able to build. The military preponderance of the US and its geographical protection will always put any North Korean attack out of the question. Even the growing deterrent capability of North Korea is not really much of a problem, because apart from the emotional driver of the bilateral history, the regional strategic considerations militate against an attack. Apart from the costs of conventional and possible nuclear retaliation, as well as the burden of pacification (the war in Afghanistan has been going on for 16 years now), the military advantages of taking US power up to the borders of China (and Russia) would be nugatory, and the erosion of political leverage in the absence of the ‘North Korean threat’ would be considerable. 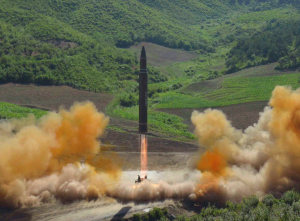 The reason why stopping North Korea’s nuclear and long-range missile program is a priority for the Trump administration is not because it truly believes North Korea will launch an ICBM at the United States. Rather, it’s that if North Korea succeeds in establishing an effective nuclear deterrent, then this could have serious geopolitical implications for U.S. policy, as other targeted nations may follow North Korea’s example to ensure their survival. This is what the concern over ‘proliferation’ is really about. Although the US has been very successful in portraying non-proliferation as a disinterested strategy to preserve global peace, it is essentially designed to preserve nuclear monopoly and deny deterrence to independent states and those that might wish to join them. As Waltz, amongst others, has pointed out, the acquisition of nuclear weapons by small states in confrontation with powerful (nuclear) states is peace-enhancing. Whether the North Korean example would really spread and erode America’s global military dominance is unclear, but it is indubitably a concern. There is a deep irony at play here given the number of UN Security Council resolutions condemning North Korea and imposing sanctions the US has been able to orchestrate, clearly in violation of the UN Charter. North Korea is no revolutionary state, such as the early Soviet Union or Maoist China. On the contrary, it is actually the embodiment of the UN Charter with its commitment to the equal sovereignty of independent states, however weak or strong. Despite the verbiage about the UN and international law, this is not an idea with which the United States has much sympathy. These three levels of American angst about North Korea, and the strategic concerns and imperatives that are generated, are both inter-related and somewhat at variance with each other. At this stage, with the successful test of North Korea’s threshold ICBM Hwasong-14, it could be argued that the US faces three strategic alternatives. The first is war, or rather war with China. The dangers of an invasion of North Korea, and the political problems that would ensue are such that it only makes sense in the context of deciding that now is the time to take out China. American military and civilian think tanks have been mulling over conflict with China for some time, so the groundwork is laid. The consequences of a US war against China would be dreadful and need no elaboration here. Fortunately, it is unlikely that the Trump administration has the strategic fortitude to embark on that. The whole business could be fairly easily presented to the world as a great triumph of American diplomacy, generosity, and wisdom. However it is difficult to envisage any American government, especially the Trump administration, contemplating such an imaginative strategy let alone being able to drive it through the dysfunctional US governance system where the immediate monetary and political profits of war tend to overshadow the strategic benefits of peace. Unfortunately, hopes that President Moon Jae-in might nudge the United States into peaceful coexistence, removing the threat of war from the Korean peninsula are fading fast. So the United States will probably opt for the third alternative–just muddling along, for some time at least, not accepting the legitimacy of North Korea and its nuclear deterrent, as well as the failure of its strategy.